Wine often travels long distances before it makes it’s way into your home. Perhaps you purchased some wine on a weekend trip to wine country and drove it home in the trunk of your car. Maybe it was shipped to you from a wine club or online retailer, from many cities or states away. Imported wines also have to travel a long distance to get to the US, and they often make it onto a retailer’s shelves just a week or two after passing through customs. Many wine professionals believe that you should let your wine “rest” after it spends any time on the road. A wine that has been exposed to the elements of long-distance travel often tastes different than the same wine that has not. There are a variety of mysterious reasons for this, but two factors are temperature fluctuations and vibration during travel. I’ve experienced “travel sickness” in wine many times first-hand, and it took me a few encounters to realize what was going on. Travel sickness and heat damage are two different things. Travel sickness seems to resolve on it’s own with a little time, while there’s no cure for a wine that’s been overheated. You never want to let your wine get hot, or expose it to excessive temperature fluctuations. When wine gets warm, the liquid expands and pushes the air out of the bottle. When it cools back down, the liquid contracts, pulling oxygen into the bottle, and causing oxidation. This is one of the reasons wine collectors store their wine in climate-controlled warehouses with very specific, stable temperatures and humidity. Wine that was exposed to hot temperatures often tastes stewed, prune-y, high in alcohol, bitter, or astringent. Wines that are simply “travel sick” often seem disjointed or out of balance. Perhaps the wine tastes more acidic than it usually does, or the oak is very pronounced. Maybe the nose is muted and closed, when the wine is typically very aromatic. Sometimes the tannin can seem abrasive and harsh, while under normal circumstances they are well-integrated and firm. Letting the wine sit in a cool, dark place for several days, weeks, or months, seems to cure it of this ailment. Don’t buy from retailers or wineries who ship during the hot summer months without taking extra precautions to ensure your wine won’t be exposed to extreme temperatures during shipping, or left on your porch on very hot or cold days. If you do have wine shipped, let it sit in a cool, dark place for at least a week (preferably longer) before you drink it. Never leave wine in your car on a warm day. 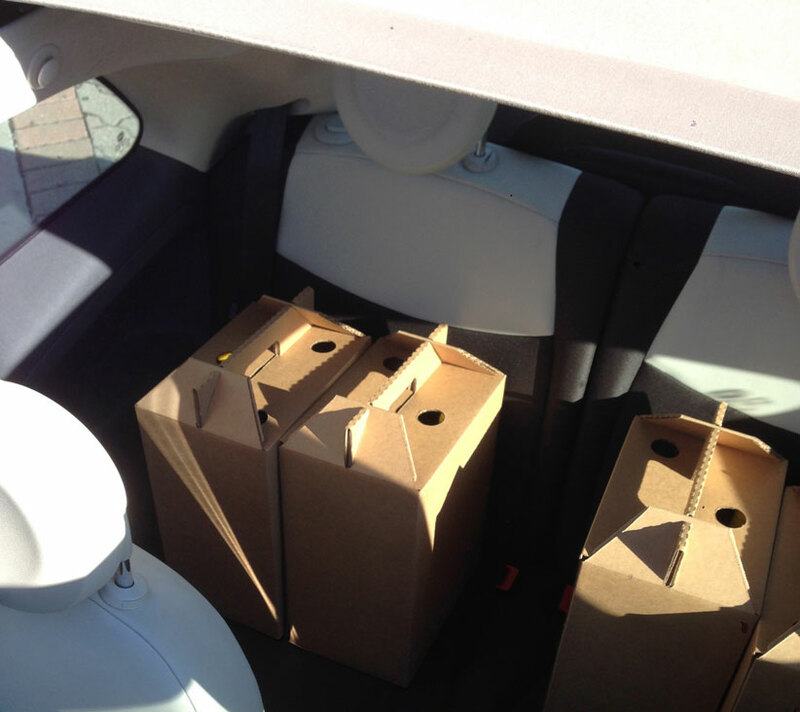 Even a cool, sunny day can be enough to make your car inhospitable to wine. If you are planning on leaving wine in your car, bring a small cooler and some ice packs to keep it cool. If you’re going on a far-away adventure on an airplane, remember that most airlines will allow you to check wine like luggage before the security checkpoint. Bring some of your favorite bottles to enjoy on your trip, or bring some discoveries back with you from your travels. Wine shipping boxes are a good idea for transport and can be purchased from most packaging supply stores. Check with your airline for specific policies for transporting wine. It’s important to remember that wine is a living, breathing thing, as well as a food product. Care must be taken when moving it around if you want it to be as delicious as it was made to be. Do your yourself and your favorite winemakers a favor by following these simple guidelines.